Never put up with constipation or straining again, proven to reduce straining on the loo! You never need to poop without your Squatty Potty again! Do you love your Squatty Potty and wish you could take it anywhere? Or maybe you’ve always wanted to try this revolutionary toilet stool but don’t have room in your bathroom? Porta-Squatty is the answer! This new foldable Squatty Potty collapses to a size that’s smaller than a laptop! Simply click open the legs to get the full benefits of a standard 7” Squatty Potty, wherever you are. The strong and durable plastic is hygienic and easy to clean. This foldable toilet step stool comes with its own soft carrying case that keeps things discreet and will protect it from knocks in your bag. Perfect for frequent travellers or those with small bathrooms, the Porta-Squatty will be your new favourite travelling companion! It was created due to demand from happy Squatty Potty customers who never wanted to be without the benefits of their toilet stool. 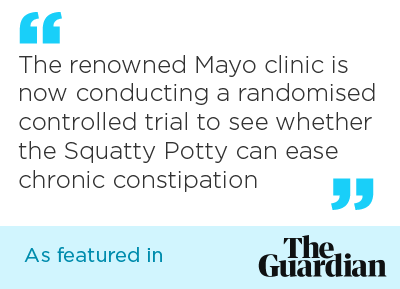 Why use a Squatty Potty? Most people are pooping incorrectly – that’s a fact! The way that modern toilets are designed forces your body into a position that’s unnatural. This is because of a muscle called the puborectalis muscle, which loops around your colon. When you sit on a toilet it constricts your colon and stops poo from getting out properly, causing straining, constipation and haemorrhoids. The Squatty Potty range of toilet stools fixes this! When you sit with your legs propped up on a Squatty Potty your puborectalis muscle relaxes and releases your colon, allowing for complete elimination with no straining. It’s so much better for you to go using a Squatty Potty! It’s amazing how one little piece of furniture can totally transform your health. Porta-Squatty allows you to maintain healthy bowels wherever you are. Easier, more complete toileting and elimination, for maximum bowel emptying wherever you go.